Southampton’s pioneering research not only played a significant part in creating the Web but is also still at the forefront of its development to ensure it continues growing to meet the demands of billions of people around the globe. The World Wide Web is the world’s largest and most complex engineered environment. Every day billions of people across the world use the Web for their work, their personal and their social lives, while major industries rely on it for their survival. It is the largest information system ever constructed and a social and technical phenomenon that has transformed the world and continues to change it in innovative and unexpected ways. No-one can predict exactly how the Web will change society, but in order to preserve its capacity for furthering global knowledge and communication, we need to understand its origin, evolution and growth, analyse how it is transforming society as well as how society is transforming it. Southampton researchers are using their in-depth understanding of the Web’s technologies and social construction to lead the way in tackling the challenge to develop new forms of economic, social, political, technological and cultural resources. The World Wide Web has changed society as we know it with its impact and scale of adoption going beyond all expectations and expanding at an unparalleled rate. 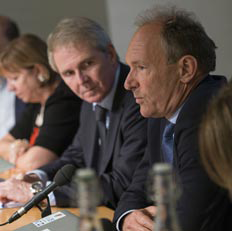 Since the invention of the Web by Southampton Professor Sir Tim Berners-Lee, the University has played a significant role in its growth and development. For more than 20 years Southampton’s interdisciplinary research team has been exploring the social and technical aspects of the Web. They have a strong depth of knowledge of the technology used to support the Web, as well as a deep understanding of how billions of people across the world use and depend on it for their business, politics and social networking. The team developed some of the earliest open hypermedia systems, applying these early insights into the Web and the development of the Semantic Web – the conversion of the existing Web into content that can be better interpreted by machines – and published an influential set of basic principles for a Web of Linked Data. They were instrumental in the foundation of the innovative discipline of Web Science, publishing a paper in top journal Science in 2006 calling for it to be established as an interdisciplinary study of the evolution and impact of the Web. Southampton researchers have also lead work on establishing open standards to support the incorporation of information about the provenance of data published on the Web to help ensure its quality, reliability and trustworthiness. Southampton’s research has influenced the Web strategies of some of the world’s biggest companies including Microsoft, IBM and Google; and has informed Web standards and government information policies around the world. Highly skilled Southampton alumni have taken up leading positions around the globe and are instrumental in creating a network of international laboratories that are working with industry to advance the Web’s development. Southampton created and now hosts the Web Science Trust (WST), a charity that supports the global development of Web Science by engaging with industry through a network of top scientists and world-class laboratories. WST is also influencing teaching practice by informing the content of Web Science degrees in the UK, USA, China, South Korea and Europe. The University runs masters degree programmes in Web Science and Web Technology and also secured £6m of Economic and Physical Sciences Research Council (EPSRC) funding in 2008 to develop a Doctoral Training Centre (DTC) to establish an integrated PhD programme in Web Science. It built on the success of this DTC in 2014 by securing another five years of funding to create a Centre for Doctoral Training (CDT) in Web Science Innovation. The CDT will train 65 students over five years to innovate in the shaping of Web growth, Web practices and Web policy. Southampton recently launched its new Web Science Institute (WSI) to pull together the myriad of Web Science research and education activity projects undertaken across the university. The WSI acts as a focal point for Web Science research at the university, including the CDT and the interface between Web Science researchers and industry, by coordinating and putting into practice research, education and enterprise initiatives on web-related developments. Southampton’s research into Web Science is also having a significant impact on the economy by creating commercial applications and spin out businesses. University researchers developed spin-out company Garlik to help consumers protect themselves from the risk of identity theft and fraud. The company had a turnover of £2.3m and won the UK National BT Flagship IT Award in 2008. Three years later it had more than half a million users and was acquired by global information services Experian. Talk to our research team and find out more about this work. Professor Dame Wendy Hall, of the Web and Internet Science group led the research on this project.